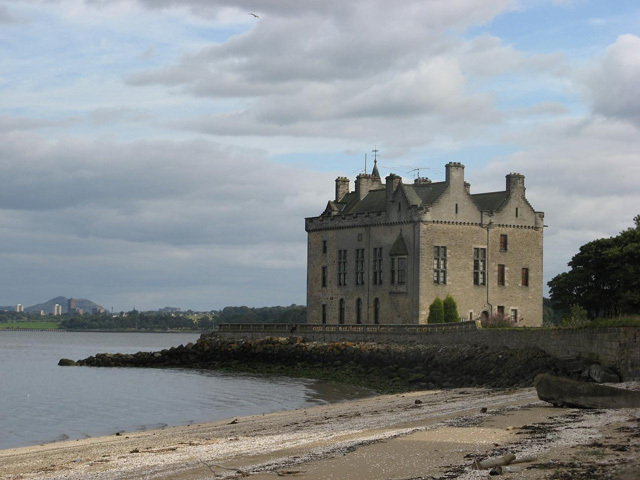 Notes: Barnbougle Castle is a much-altered tower house on the southern shore of the Firth of Forth, between Cramond and Queensferry. It lies within the Earl of Rosebery's Dalmeny estate, just northwest of Dalmeny House. Although its history goes back to the 13th century, the present castle is the result of rebuilding in 1881 by the 5th Earl of Rosebery, who served as Prime Minister from 1894-1895. Barnbougle was owned by the Mowbrays, a Norman family who were also lords of Dalmeny and Inverkeithing. The first building was a thirteenth-century tower house, constructed by Philip Mowbray. In 1615 the Mowbrays sold Barnbougle to Sir Thomas Hamilton, afterwards Earl of Haddington. It was sold again, by Sir Thomas' grandson in 1662, to Sir Archibald Primrose of Carrington, a senior judge who became Lord Justice General of Scotland in 1676. Sir Archibald's eldest son by his second marriage, also Archibald Primrose, was created Earl of Rosebery in 1703, and Barnbougle became the family seat. At some point during the 17th century, the original tower house was rebuilt or replaced. In 1774, a plan for rebuilding the castle was drawn up by the architect Robert Adam. This proposal was for a triangular building, with the original tower at its seaward corner, but it was never executed. By the early 19th century, the castle had become dilapidated, and a wave supposedly washed into the dining room during supper. The 4th Earl of Rosebery had Dalmeny House constructed on the estate, and the family moved in on completion in 1817. Barnbougle was used to store explosives, and after being damaged in an accidental explosion, it was subsequently left as a ruin. In 1881 the castle was entirely reconstructed and extended according to plans by James Maitland Wardrop, of Wardrop & Reid, in the Scots Baronial style. The older fabric of the north side was incorporated into the new building. It was primarily built to house the private library of Archibald, 5th Earl of Rosebery (1847-1929), who became Prime Minister in 1894. Lord Rosebery practised his speeches here, in a purpose-built gallery. Barnbougle remains a part of the Dalmeny Estate, and is still the property of the Rosebery family. It is a category A listed building.